ATLANTA – The Atlanta Hawks defeated the 76ers, 127-125, Saturday night at the State Farm Arena. - The Sixers continue to play based on their opponent’s talent level. They play up to the top-tier teams and down to the low-tier teams. How else can you explain their victories over the Boston Celtics (Wednesday) and Milwaukee Bucks (March 17) and their loss to the Hawks? - Joel Embiid has to attempt more shots. The two-time All-Star only had 11 shot attempts, He did, however, go 11-for-14 from the foul line, Howver, all of the other Sixers starters had more shot attempts than the two-time All-Star and franchise player. That can’t continue to happen if the Sixers expect to make a deep-playoff run. 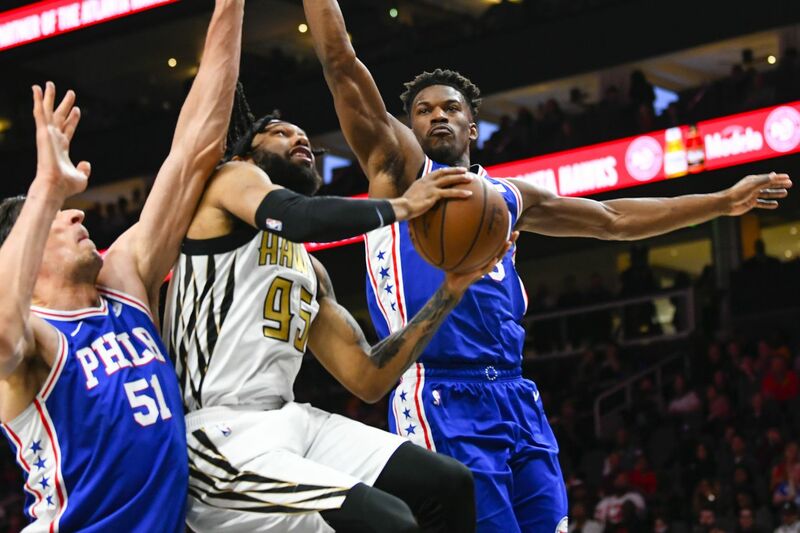 - The Sixers’ defense was, once again, horrible. However, their turnovers and lack of awareness in key situations also doomed them, especially late in the game. Embiid turned the ball over on consecutive possessions. The first one came when he lost the ball with 1 minute, 40 seconds remaining. The second one occurred on the bad pass 13 seconds later. Then with the score tied at 127, Jimmy Butler had a shot-clock violation with 3.5 seconds left. - Best performance: Trae Young has to get this award. The Hawks rookie point guard had game highs of 32 points and 12 assists. Young also scored the game-winning basket with 0.1 second left. - Worst performance: I had to give this to Kent Bazemore. The Hawks reserve swingman missed six of his seven shot attempts – and all four of his three-pointers – en route to finishing with three points..
- Best defensive performance: This goes to Simmons for the second-straight game. The Sixers point guard had a game high of four steals to go with two blocks. - Worst statistic: This goes to the Sixers’ seven turnovers in the fourth quarter. -Best statistic: This goes to Young scoring 21 points on 7-for-8 shooting in the first half.